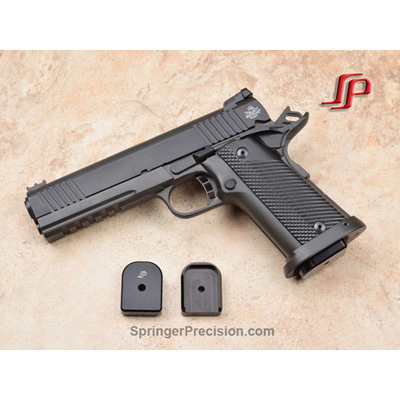 Armscor Rock Island Armory 9mm or .38 Super 1911 A2 and Armscor 1911 A2 FS PS 9mm 10 round magazine with the nickel finish, Mec-Gar Para Ordnance P18 10 RD magazine MGP183810N. These are double stack magazines, they don't fit single stack 1911's. Please note these magazines don't have the slimmer extended base that comes on the magazines used in the Rock Island Armory 1911 A2 with the magwell. The magwell may interfere with the insertion of these magazines. The Rock Island Armory 22TCM originally came with the Mec-Gar P18 magazines but there has been modifications made to the feed lips to increase reliability with the 22TCM. These magazines don't have the modified feed lips. While some have used these magazines with the 22TCM with no issues many have feeding problems. The magazines were made for the 9mm and .38 Super and there is no need for modified feed lips when used with either the 9mm or .38 Super. If used with the 22TCM there may be feeding problems. Don't expect the magazines to be 100% reliable with the 22TCM. Note these Para P18 magazines aren't compatible with the Para P18.9 or models with the magwell. The Para Pro Custom 9mm with the magwell takes a different longer magazine. Constructed from certified carbon steel and features a heat treated housing and high-impact polymer or certified carbon steel follower and floorplate. The magazine spring is made of high strength type "D" music wire-the strongest wire available. TIG welding provides additional strength and a seamless finish. Each magazine surface is specially treated to ensure high corrosion resistance. Mec-Gar is proud to be the Original Equipment Manufacturer of magazines to most of the prominent firearm manufacturers for the last 40 years including AMT - Armscor - Astra - Beretta Bernadelli - FN Browning - BUL - Charles Daly - Colt - CZ - IMI - Kel-Tec - Kimber - Llama - North American Arms - Remington - Sigarms - Smith & Wesson - Springfield Armory - STI - Standard Arms - Star - Steyr - Tanfoglio - Taurus - Walther. Please Select ACT-MAG ADCO Armscor - Rock .. BERETTA CANIK CZ FISHER PENS-BUL.. GLOCK HOGUE HUDSON MAGLITE MagLULA MEC-GAR METALFORM RAE Industries RUGER SIG SAUER SMITH & WESSON SPRINGER PRECIS.. Tisas Zigana WALTHER WILSON COMBAT X-GRIP BY FREED..